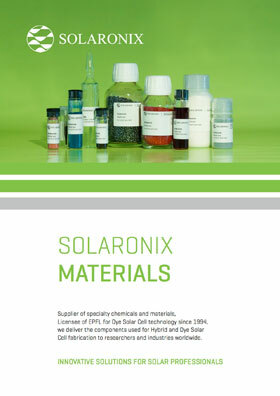 Solaronix strives to stay at the cutting edge of solvent-free electrolyte development. The Mosalyte product line provides non-volatile electrolyte formulations based on ionic liquids. These innovative electrolytes demonstrate a negligible vapor pressure that makes them compatible with high temperature and diverse sealing processes. Our most experienced customers may also enjoy preparing custom ionic liquid mixtures from our IonLic product line presented next page. A non-volatile iodide/tri-idodide electrolyte formulated for high longevity. Features a mixture of three ionic liquids which demonstrate a low viscosity for optimized mass transport. Benefits from the same formulation of Mosalyte TDE-250, but a with a lower iodine content suitable for low-light applications such as indoors. The equivalent of Mosalyte TDE-250 but with lower iodide concentration and lower viscosity, especially suited for low-light applications.